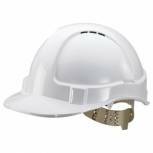 Comfort Vented Safety Helmet White BBVSHW Pack of 1 Proforce comfort helmet with high comfort sweatband. Features 4 point polythene harness and low dome profile with rain channel. Made from high impact UV stabilised HD polythene. Colour: White. 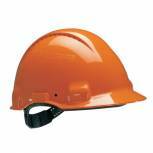 3M Peltor Safety Helmet Orange G3000 Pack of 1 3M Peltor Safety Helmet Orange G3000. Designed for forestry and industrial workers. Short brim. Extra ventilation. Rotates 180 degrees. Uvicator Sensor Disc. 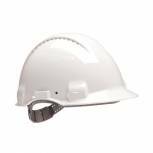 3M Peltor Safety Helmet White G3000 Pack of 1 3M Peltor Safety Helmet White G3000. Designed for forestry and industrial workers. Short brim. Extra ventilation. Rotates 180 degrees. Uvicator Sensor Disc. 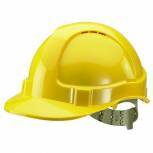 Comfort Vented Safety Helmet Yellow BBVSHY Pack of 1 Proforce comfort helmet with high comfort sweatband. Features 4 point polythene harness and low dome profile with rain channel. Made from high impact UV stabilised HD polythene. Colour: Yellow.